For once, the Obama administration has proposed a compromise that actually makes some sense. The 2010 Nuclear Posture Review, finally released yesterday, does not grant every gift that a nonproliferation activist would want –- it retains, in particular, the right to strike first against a nuclear-armed nation. But by eliminating ambiguities and deployment options found in previous incarnations of stated US strategy, Obama's NPR represents a marvelous, much needed breath of sanity. Perhaps most importantly, Obama is finally shifting the strategic stress away from the (nonexistent!) USSR and towards the far greater threat of nuclear terrorism. In accordance with last week's New Strategic Arms Reduction Treaty with Russia, the US will reduce its stockpile to 1550 warheads (though new counting rules mean that the actual reduction will not be as great as it seems). The NPR also announces the administration's intention to work more closely with Russia and China towards lowering the possibility of nuclear terrorism, praising previous cooperation with Russia while encouraging China to be less secretive about its nuclear program and strategy. Although the US will maintain its forward-deployed nuclear weapons in Europe, this is largely so as not to upset NATO allies by taking unilateral action, and the issue will likely be discussed formally during this year's revision of the NATO Strategic Concept. Across the board, diplomacy will take on a greater role than nuclear threats in preventing international confrontation. Strategically, the new NPR limits possible nuclear targets to nations that either possess nuclear weapons or are in violation of the Nuclear Non-Proliferation Treaty. This excludes countries with chemical or biological weapons, which previous Reports included as targets, but includes countries (like Iran) that are in the process of developing nuclear weapons. Particularly since the United States will retain its right to strike first in the face of a nuclear threat, this represents a potentially deep fault that arms control activists will find with the new NPR: concerns that the US would use nuclear weapons to destroy Iran's Uranium enrichment capabilities will remain valid. However, the tone of the Report provides great consolation. "It is in the U.S. interest and that of all other nations," the NPR states, "that the nearly 65-year record of nuclear non-use be extended forever." (p. ix) Deterrence against nuclear attack is now the sole purpose of the US arsenal; and even then, the "United States would only consider the use of nuclear weapons in extreme circumstances to defend the vital interests of the United States or its allies and partners." (ibid) This represents a major revision of the previously stated strategy of the United States, which allowed the offensive use of nuclear weapons in a much wider range of scenarios. The NPR also introduces or strengthens a range of safety measures, which in any other realm would be mundane but in this case are intensely interesting. United States Intercontinental Ballistic Missiles (ICBMs) will no longer be armed with multiple independently targetable warheads (MIRVs), which always struck me as an insane thing to do anyway. Although the alert status of the US nuclear forces will not be downgraded (ie, we can launch an ICBM on one minute's notice), the practice of automatically targeting all weapons into the open ocean will be continued so as to reduce the consequences of unintended launch. The command structure will also be reorganized slightly so as to give the President more time to consider retaliation options in the event of a nuclear attack on the US or its allies. At the beginning of the Review, Secretary of Defense Gates recommended a $5 billion transfer from the Department of Defense to the Department of Energy for investment in the nation's weapons laboratories (Los Alamos, Livermore and Sandia). Presumably this funding is primarily intended for research into warhead maintenance, which the administration explicitly sees as the only alternative to building new weapons as well as the most secure route towards eliminating redundant parts of the stockpile: as it is precisely the fact that Uranium and Plutonium decay that makes them so potentially destructive, ensuring that aging weapons still function without nuclear tests (which have been banned since 1992) requires some ingenuity and expense. Of course, this course can't be maintained forever. As all three weapons laboratory heads warned last month, at some point the United States will have to build more nukes if it wants to have any at all. It is also unclear from the NPR whether this $5 billion includes or is in addition to the $2.7 billion (a 25% increase) mandated by the Report for the Department of Energy's nonproliferation programs. 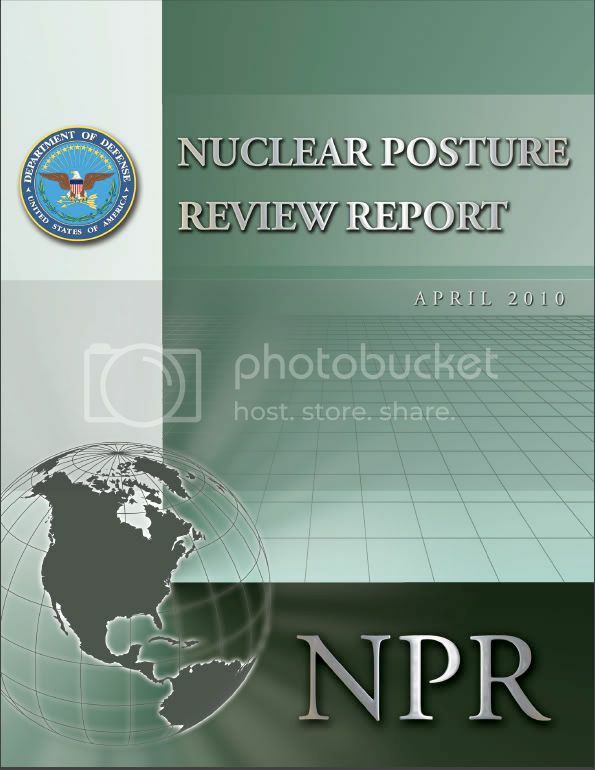 Thus, although the NPR reaffirms the intention of the United States to retain nuclear weapons for as long as they exist elsewhere in the world, it also commits to an unambiguous reduction in the role that they play in the nation's defense. Though that may seem a trivial shift in the face of only modest stockpile reduction, it actually represents a sea change in nuclear policy: that the report ends with a section entitled "Towards a World Free of Nuclear Weapons" is an accomplishment that could only be possible after a conceptual realignment along the lines of what I described in my last post on this subject. For this work, the Obama Administration and other nonproliferation-minded governments around the world should be applauded. "Perhaps most importantly, Obama is finally shifting the strategic stress away from the (nonexistent!) USSR and towards the far greater threat of nuclear terrorism. If only we could shift away from the nonexistent USSR for the rest of our Military budget! It's worth a read! In addition to being surprisingly well-written, it's only 70 pages, maybe 15 of which aren't real content.